HAVING a passion for her art studies has propelled Sharon Davies to new heights in her young career. 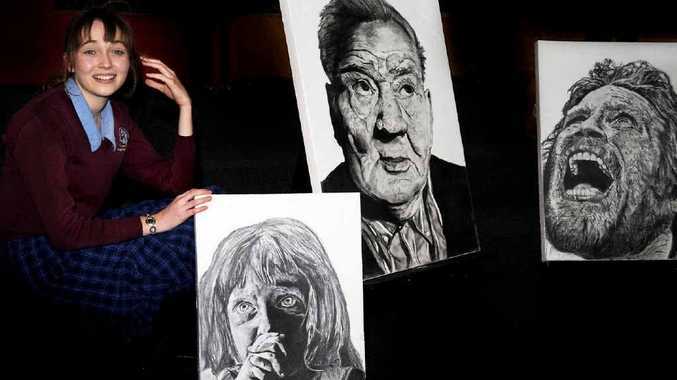 Her impressive artistic calibre has proven the Year 12 Fraser Coast Anglican College student a worthy winner of the Hervey Bay Regional Gallery's Senior Student Art Bursary. The $1600 bursary will give Sharon the opportunity to attend the Flying Arts Artiz Young Artists Development Program in Townsville from June 26. Artiz is an annual four-day intensive training and skills development event for talented young artists aged 15-18 years from across Queensland who are thinking about a career in the visual and media arts. Sharon's artworks will be on display later this year in the new Hervey Bay Regional Gallery venue, the Fraser Coast Cultural Centre, currently being built. The young artist said she was excited about the event, at the James Cook University campus, and was looking forward to what it had to offer. Fraser Coast Anglican College art teacher Cassie O'Brien said Sharon was "an amazingly passionate visual art student who seems able to apply technical skill and creativity to any media she turns her hand to". Hervey Bay Regional Gallery director Marj Sullivan said Sharon's application demonstrated her ability to develop and resolve visual art projects with a mature and confident attitude. "Sharon enjoys the challenge of creating art that provokes or challenges her audience as well as herself," Ms Sullivan said. The Hervey Bay Regional Gallery Senior Student Art Bursary is offered annually. Any Year 10, 11 or 12 student aged 15 to 18 years from a state or independent school in the Fraser Coast region who is undertaking visual arts studies is eligible to apply.